Review by Andrew W. Griffin, here. Review by Nick Redfern, here. 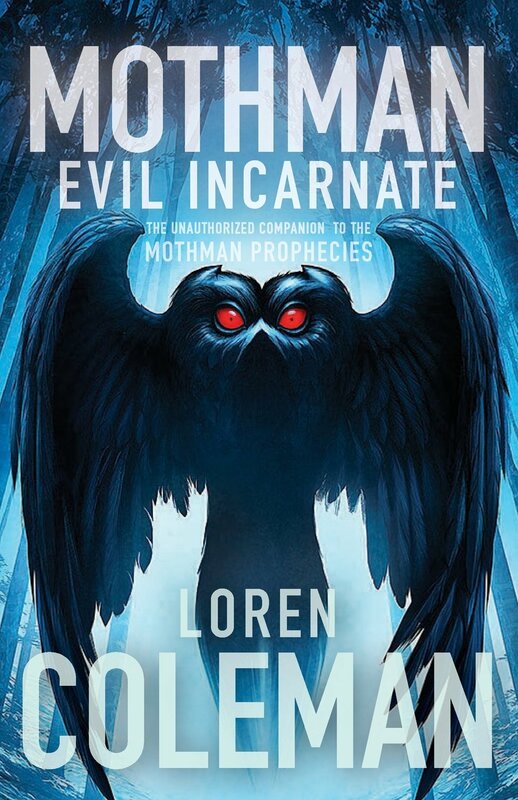 "Mothman Math" is the underlying bits of twilight language that entwine numbers, prophecy, and the evil events that haunt the fabric of Mothman-related interactions. It involves a type of arithmetic that links to augury, the prophecies that have been tied to sightings of Mothman. Whether factual or not, a psychological pattern has emerged, almost in a folkloric sense, related to a specific numeral that routinely appears in the Mothman story. "Prophecies," of course, are important parts of the Mothman tale, and the motion picture version of The Mothman Prophecies extended the "banshee" elements of the story. The movie was fiction-based on a true story. Some of its enhancements created greater fictions. Dates, disasters, and deaths do dwell along the edges of this story. But we can be openly skeptical of many portions of what we are being told. 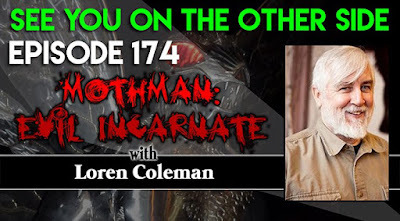 John Keel and I openly discussed with the media, and did our best to straighten out the record regarding the mythos that became the Chernobyl “Mothman” accounts. The Chernobyl story, the Galveston Hurricane-Mothman tie-in, and other examples given in the 2002 movie were pure fiction....Right after the movie was released, various websites posted the Chernobyl/Mothman sightings as factual. 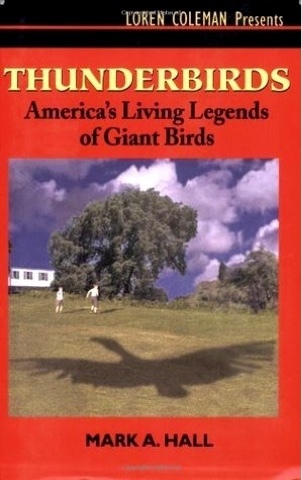 But there is not one thread of evidence that any winged weirdies were witnessed before the Chernobyl accident. It is a bit of movie fiction that has, unfortunately, moved into pseudo-factoid cryptozoology. What facts are behind the fiction? Beyond the synchrocinematic mischief, nevertheless, most people know there is Mothman math that authentically revolves around the number "13." In my 2002 book, Mothman and Other Curious Encounters, I looked at how 13 months after the "first" sighting of Mothman on November 15, 1966, the "prophecy" implied in the title The Mothman Prophecies occurred. This happened when the Silver Bridge collapsed as the White House Christmas tree lights were illuminated on December 15, 1967. The number 13 is considered an unlucky number in some countries. The end of the Mayan calendar's 13th Baktun was superstitiously feared as a harbinger of the apocalyptic 2012 phenomenon. Fear of the number 13 has a specifically recognized phobia, Triskaidekaphobia, a word coined in 1911. The superstitious sufferers of triskaidekaphobia try to avoid bad luck by keeping away from anything numbered or labelled thirteen. As a result, companies and manufacturers use another way of numbering or labelling to avoid the number, with hotels and tall buildings being conspicuous examples (thirteenth floor). It's also considered unlucky to have thirteen guests at a table. Friday the 13th has been considered an unlucky day. Source. 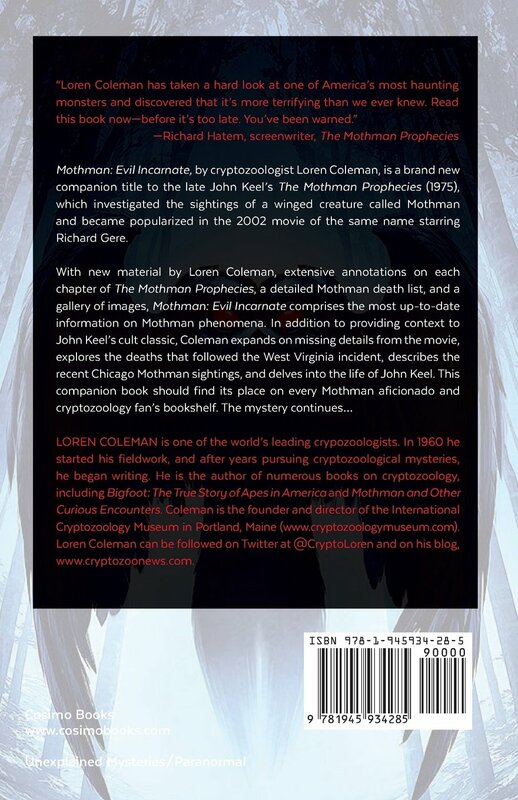 In my new 2017 book, Mothman: Evil Incarnate, I document how the number 13 plays a deeper role in the Mothman timeline. 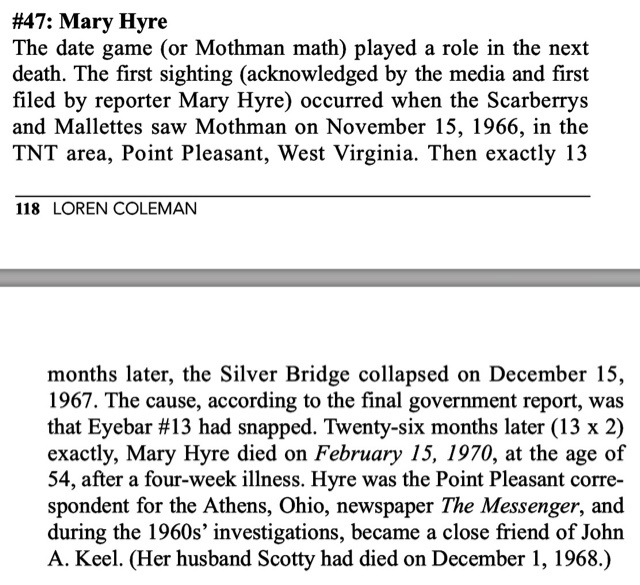 The first sighting, the collapse of the Silver Bridge, and when Mary Hyre died all are linked to the number 13 in the Mothman melodrama. 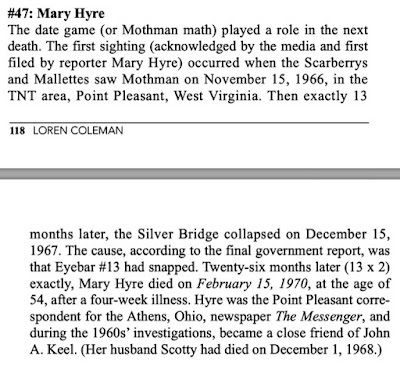 Thirteen months after the "first" Mothman sighting (Nov 15, 1966), the Silver Bridge collapsed (Dec 15, 1967). The only problem is that the Scarberry-Mallette encounter of November 15, 1966, was the "first" sighting that showed up in the media. There were other sightings that occurred before that one. But the November date is retained as the "first" and thus exactly 13 months to the day, the bridge came down. As I mention in my book (due out by the 50th anniversary of the Silver Bridge collapse - December 15, 2017), "Mothman math" figures in other links. The complex use of "Mothman math" as a yardstick for measuring these events, involving the number 13, has now (via comments online) been applied to the new Chicago Mothman sightings. How should we look at the dates involved? In my research on the most recent series of Chicago "Mothman" sightings, the first media-acknowledged 2017 encounter, report, and story is dated to April 7, 2017. But by July 2017, it was becoming commonly accepted the real (unpublished) initial sighting was on March 22, 2017. Therefore, by traditional "Mothman math," the predicted 13-month date for a Chicago-based disaster event would be tied from the publicized "first date" to the one exactly 13 months later: May 7, 2018. However, I would not wish to tempt fate with a series of elevator tours of the Chicago skyscrapers on April 22, 2018. As students of terrorism understand, double-number dates like 11 & 22 have been especially attractive to terrorists in the modern era. Should we look at older dates linked to "Mothman sightings," and apply "Mothman math" to them, to test the auguric arithmetic? Lon Strickler tells me that the first date for the 2011 little-known series of Chicago Mothman encounters was June 29, 2011. What happened on July 29, 2012, thirteen months after the Chicago incident? Tropical Storm Khanun killed 88 people and left 60,000 homeless in North Korea. Another case to examine is what the late Mark Chorvinsky (who died July 16, 2005), editor of Strange Magazine, called the "Potomac Mothman." On July 27, 1944, at 8:30 pm, Father J. M. Johnson, pastor of St. John's Church in Hollywood, Maryland, saw in the sky "the outspread form of a huge man with wings." What date would have been 13 months after the "Potomac Mothman" sighting? That would have been August 27, 1945. What happened on August 27, 1945? The Texas hurricane made landfall near Seadrift, Texas. The storm resulted in three fatalities and $20 million in damage. The first United States Navy carrier plane touches down on Japanese soil, at Honshu/Atsugi Airdrome. The American occupation begins. Will a disaster happen on May 7, 2018? Or on April 22, 2018? In Chicago? Elsewhere? A tornado? Only time will tell? But certainly, those who use "Mothman math" may be on the lookout. The Original Point Pleasant WV Mothman reports started in November 1966 and ended in December 1967 with the collapse of The Silver Bridge. This makes it a 13 month period of strange events. The Silver Bridge Collapsed because of the faulty 13th steel pin eyebar. The name Point Pleasant has 13 letters in it. The most polluted pond in The TNT Area , where many of the sightings took place, was pond 13. The Men In Black were reported to have been harassing witnesses and telling them not to talk about The Mothman. The phrase "The Men In Black" has 13 letters in it. 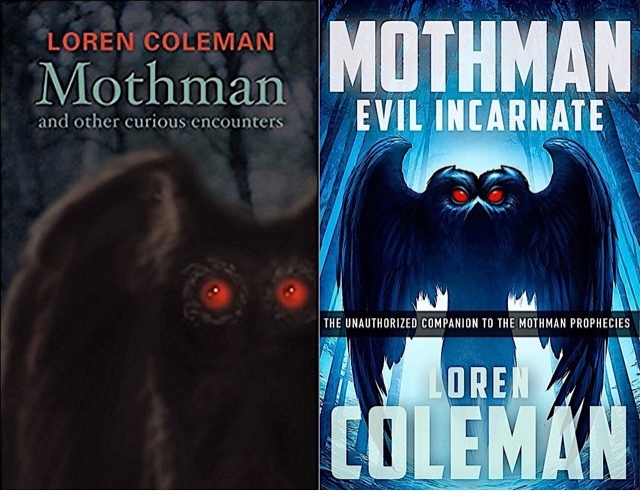 The name Mothman Museum has 13 letters in it. The maiden name of Mothman witness Linda Scarberry is Linda McDaniel which contains 13 letters. Linda Scarberry claimed to have seen the Mothman on her roof when she lived on 13th street. The name of Mothman witness Steve Mallette has 13 letters in it. The name of Mothman witness Kenneth Duncan has 13 letters in it. The name of Mothman witness Mabel McDaniel has 13 letters in it. The name of Mothman witness Katluyn Beaver has 13 letters in it. Everett Wedge was with four other pilots during his sighting, the name of one was Ernie Thompson which contains 13 letters. Faye Dewitt-Leport is said to have had her encounter with the Mothman at the age of 13. Owner of the Mothman Diner and prominent Point Pleasant local, Carolin Harris, also has 13 letters in her name. The 2017 documentary The Mothman of Point Pleasant was directed by Seth Breedlove, who has 13 letters in his name. Both the phrase "West Virginian" and "The Ohio Valley" have 13 letters in them. Artist Frank Frazetta did cover art for The Mothman Prophecies, he also has 13 letters in his name. In relation to the Indrid Cold story, the term "Parkersburg WV" and "Mr. Derenberger" have 13 letters in them. John Keel, the main investigator of the Mothman suffered a non-lethal heart attack and was hospitalized on Friday, October 13th 2006. 13 people died in The Mississippi River Bridge Collapsed in 2007 after a sighting of the Mothman. There are 26 sightings on John Keel's Mothman sightings list printed in his book, Strange Creatures From Time And Space. 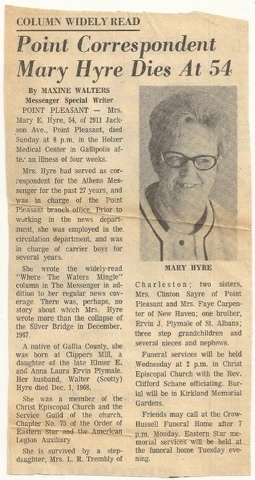 Mary Hyre died on February 15th 1970 which is 26 months after the The Silver Bridge Collapse. Three Mothman sightings are said to have taken place on November 26th 1966. The witnesses are: Ruth Foster in St. Albans WV, Marvin Shock and Ewing Tilton in Cat Creek Ohio, Women and Thirteen year old child in Charleston WV. Source. Obtain the above two books - numbered special, signed copies - by Loren Coleman, here. 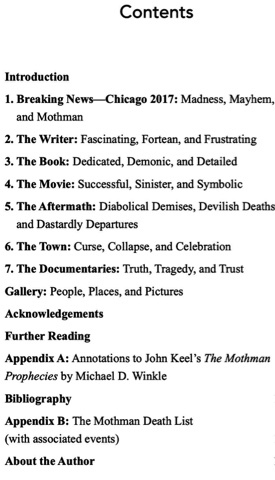 The table of contents of Mothman: Evil Incarnate. Link to this podcast, here. Loren, this strikes home so close. I first traveled to Point Pleasant in May 2016, on my way back from Cleveland Ohio. My birthdate is 6-13-66. I have visited Point Pleasant a total of four times these two years, going inside an open igloo a highlight! We've a structure in NC, Town Creek Indian Mound that has a sun room igloo of eerily similar structure. My last trip to Cleveland this past June, I visited my friend Taunia Derenberger Bowman, a lovely woman who has had a remarkable and chaotic life. Not sure if I should mention my 20 plus year marriage falling apart since 2012, or the broken down Olds Aurora that sat in our yard up until I left the house, which is being foreclosed anyway!Without detailing events I have experienced and paths I have crossed, I can verify these maladies come with baggage both real and imagined. Humor helps!